Travel and adventure inspire and shape who we are and how we show up in the world. Outfitting people to better enjoy their adventures is at the heart of what we do at TB&C. The first step to doing that well is fostering an environment where staff have the flexibility and support to explore the world and discover what motivates them. Across from the train station in Chamonix, France. In a society increasingly focused on productivity and output, I am increasingly grateful to work for a company who not only encourages a healthy work/life balance, but celebrates time away from work. There's nothing that recharges the batteries quite like immersing oneself in the beauty and wonder of the natural world. There's little that builds confidence like navigating a new landscape whether that be in nature or down cobbled stone streets of a breathing European city. Coastal view of Nice, France. Though we are always sad so lose great people for prolonged travel, we know that time off to discover a new environment using products from TB&C gives our team members an authenticity that transcends any in-store training. Matt staying in climbing shape in Seville, Spain. Matt says hi from up high on the Aiguille de Midi in Chamonix, France. “After a month and a half studying history in London, I decided to spend the rest of the summer traveling through Europe. I started with the short flight from London to Madrid. After 3 days in Madrid, my Eurail Pass kicked in. I had 22 days to make it to Rome, by any route I wanted. From Madrid I went to Sevilla, and from there to Cartagena and to Barcelona, soaking up the Spanish language and culture. From Barcelona, I traveled to Avignon to see the Pont D’Arc Roman Aqueduct. From Avignon I jetted to the French Riviera cities of Nice and Monaco. From there to Chamonix in the French Alps, and then to Interlaken and Grindelwald in Switzerland. Then I went down the other side of the alps to Salzburg, Austria. From there I took an overnight, 9-hour train to Venice. From Venice’s canals, I ventured to the cobbled streets of Florence and then to Siena, Tuscany. From there, I went to Rome for 5 days to soak up the archaeology and history before my flight back to NC for school and work. All of this travel was done by public transport; regional trains, subways, city and regional buses (water buses in the case of Venice). All of my travel was at most planned a day in advance." Statue pointing in the center of Chamonix, France. "My trip was inspired by the sort of Grand Tour that “Gentlemen” of the 19th century took. I suppose I told myself that this trip was really about self-improvement: about learning art, and language, and culture. There was a lot of that, in art museums and fancy cafes, but there was another unspoken objective: Adventure. From kayaking in Venice, to scrambling and climbing in Chamonix, or cliff jumping in Nice, adventure also made me develop as a person. Through adventuring I learned I could be adaptable, learning through experience as I spent every day taking the next train in the general direction of Rome." 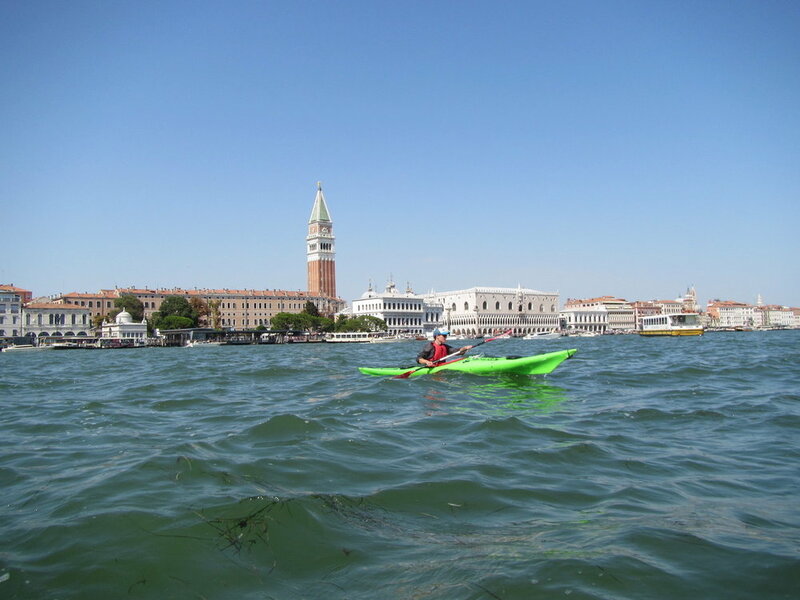 Sea kayaking in Venice, Italy. "TB&C saw the potential that this kind of transformative experience could have on an employee. They gave me training on and access to the right kinds of equipment to pack and prepare so that I could have a successful trip. They gave me a staggering 3 months off with no complaints. I’d like to think their investment and faith in me has paid off. I’ve come back with the ability to help people plan for adventure travel, to decide what to pack and what to leave behind. But, more importantly, I’ve come back with a wide view of the ways that we differ as people and an understanding of how to appreciate and celebrate those differences. Like my name tag, I try never to come into work without bringing that understanding with me." View from Bridge of Sighs in Venice, Italy. Sunset over the River Arno in Florence, Italy. Did Matt's adventure inspire you? Look forward to reading more staff adventure spot lights each month on the Glass Top Counter. We will also be featuring customer adventure spot lights! What amazing adventures have you been on in NC and beyond? Send a 250 word pitch to tbcbetsy@gmail.com. If chosen for a feature post, you will be thanked for your time with a TB&C hoody or tote bag of your choice.